The audit management functionality offered within SAP software is a fully integrated flexible and comprehensive tool It is based on the SAP NetWeaver technology platform. Globalnest SAP audit management application is highly flexible and configurable and supports various types of audits and related standards. 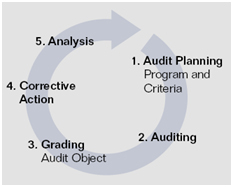 The audit management application covers the entire auditing process from planning and executing audits to defining corrective and preventive actions to reporting the audit results.